The ICI Ensemble Munich (International Composers & Improvisers) is a loose group of German musicians, with varying line-ups. They have developed their "Composer in Dialogue" concept to which they invite modern composers, with so far Olga Neuwirth, Barry Guy, Pierre Favre, George Lewis, Giancarlo Schiaffini und Vinko Globokar as invitees. From what I could find, only the collaborations with Neuwirth and Lewis were released on record, but I must say that - like most avant-garde music - their promotion is as amateurish as their music is good. In 2009, the band invited William Parker to compose for them, and the result is absolutely staggering. Parker has of course composed for improvisational orchestras with his own Little Huey Creative Music Orchestra, music of incredible density and freedom. After some questionable side-steps in the past years, we find the New York artist back in full glory. 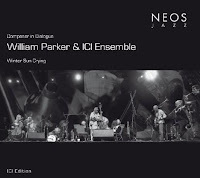 In fifteen relatively short compositions, Parker develops incredibly coherent gems of sound, with the gravity and solemnity of a Bill Dixon, all forming one single suite, and with a lightness of arrangements that belies the size of the octet, because instruments come and go, for short bursts of sounds, a few phrases. Parker seems to try to evoke the strong memory imprints of his life or youth : "Bells", "Train", "Explosion", "Tears", or the space around : "Earth", "Moon", "Sky", but then in a deep and meaningful way : full of emotion and sprituality : "Hope", "Revolution", "Winter Sun Crying". The "Train" sounds like a train, or rather the shadow of a train. "Earth" is all angular and hard and unpredictable. "Moon" is slower and eery with unison howls and crescendos. "Explosion" is built around incredible tension, with weird background noises and dark rumbling drums laying the backdrop for innocent flute playing, juxtaposing Not surprisingly, the last piece, "Let's Change The World" is as fragile as it gets, almost transparent music with Parker's bamboo flute adding a kind of universal song for mankind. Credit also goes to the entire band, who really move as one, with a great sense of direction creating sonic environments that are open in nature. To be clear, this is not all improvisation : this is well thought-through and structured music, with room for exploration and emphasis, and it makes it all the powerful for the listener. This is jazz in its most modern shape and at its best : intelligent, complex, compelling, technically superb, surprising, deep, emotional. Not to be missed and to me for sure one of the contender of album of the year. Looks very interesting. However I didn't know that William Parker played all those instruments, I'm rather curious! Thanks for the review! Unfortunately is some information missing in the line up from the ICI:on the album also are Martin Wolfrum, piano, and myself, Johanna Varner, on cello. Hi Johanna, my apologies. I will rectify this immediately. I copied the line-up from another website (avoids too much typing, but it also copies mistakes apparently). Great music!! Thanks a lot.